The New York Times recently published an article, signed by Nicholas Wade, which describes how two recent genetic studies indicate the Ashkenazi and Sephardic populations in Europe genetically much closer than the common perception of their cultural identities seems to suggest. Jewish Italy is presented as their meeting point, but also as their source. One explanation is that they come from the same Jewish source population in Europe. The Atzmon-Ostrer team found that the genomic signature of Ashkenazim and Sephardim was very similar to that of Italian Jews, suggesting that an ancient population in northern Italy of Jews intermarried with [non-Jewish] Italians could have been the common origin. The Ashkenazim first appear in Northern Europe around A.D. 800, but historians suspect that they arrived there from Italy. 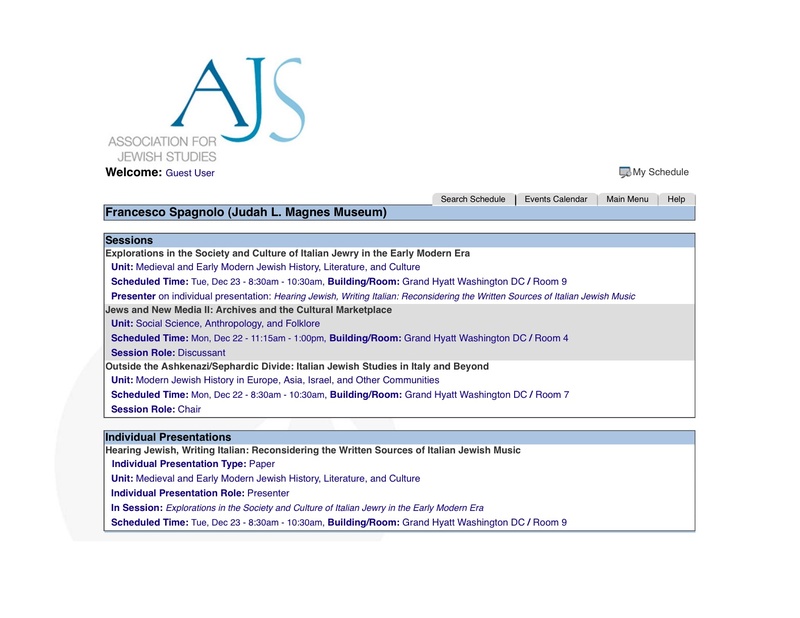 Those who follow the destinies of the musical traditions of the Jews in Italy know well that the differences among the Italian, Sephardic and Ashkenazi minhag depend as much on the cultural context (the confluence of different Diasporas, and the meeting with co-territorial cultures) than on their origins drawn from the mihagim of the global currents of the Jewish Diaspora. In other words, the musical and liturgical koiné of the Jews in Italy is a perfect example of the genetic and cultural stratification suggested in the article. For those who know a little about this topic, the feeling of “surprise” that permeates the article is the symptom of a cultural stereotype that is hard to die: that of a dichotomized, rather than dynamic, view of Jewish culture (or perhaps of culture in general). The sense is that both geneticists and historians could benefit from learning more about Italian Jewish music (and perhaps Jewish music in general). Il New York Times ha recentemente pubblicato un articolo, a firma di Nicholas Wade, che descrive come due recenti studi genetici indicate che le popolazioni ebraiche ashkenazite e sefardite in Europa siano molto più vicine geneticamente di quanto la comune percezione delle loro rispettive identità culturali sembri indicare. L’Italia ebraica ne viene presentata come il punto d’incontro, ma anche di origine. Secondo i due studi, gli ebrei ashkenaziti e sefarditi possiedono circa il 30 per cento di patrimonio genetico europeo, mentre il resto viene dal Medio Oriente. Le due comunità appaiono molto simili l’una all’altra dal punto di vista genetico, il che è un elemento inatteso poiché hanno vissuto separate così a lungo. Una spiegazione è che abbiano origine dalla stessa fonte di popolazione ebraica in Europa. Il team di Atzmon-Ostrer ha stabilito che la firma genetica degli ashkenaziti e dei sefarditi sia molto simile a quella degli ebrei italiani, suggerendo così che una antica popolazione di ebrei dell’Italia del Nord, mescolatasi con gli italiani [non ebrei] possa esserne l’origine comune. Gli ashkenaziti fanno la loro apparizione in Europa settentrionale intorno all’anno 800 dell’Era Comune, ma gli storici sospettano che vi siano giunti dall’Italia. Un’altra spiegazione, forse complementare alla precedente, è che durante il Medio Evo vi furono molti più scambi e relazioni matrimoniali tra le due comunità di quanto non si credesse. La genetica conferma una caratteristica già osservata dagli storici: che ci furono più contatti tra ashkenaziti e sefarditi di quanto non si sospettasse, con l’Italia come punto di innesco di questo scambio, ha spiegato Aron Rodrigue, uno storico dell’Università di Stanford. Un cognome comune fra gli ebrei italiani è Morpurgo, che indica l’origine di una persona da Marburg, in Germania. Analogamente, ha detto il dr. Rodrigue, on dei cognomi più comuni fra i sefarditi che si stabilirono nell’Impero Ottomano è Eskenazi, a indicare che molti ashkenaziti si unirono alla comunità sefardita in quelle terre. Le due ricerche genetiche indicano che “ci possano essere origini comuni condivise dai due gruppi, ma anche che vi furono ampi contatti e insediamenti,” ha detto ancora il dr. Rodrigue. Chi segue i destini delle musiche tradizionali degli ebrei in Italia sa bene che le distinzioni tra minhag italiano, sefardita e ashkenazita dipendono dal contesto culturale (incontro tra diaspore diverse, e confronto con le culture co-territoriali) tanto quanto dalla filiazione dei mihagim dalle correnti globali della diaspora ebraica. In altre parole, la koiné musicale e liturgica degli ebrei in Italia è un esempio calzante della stratificazione genetico-culturale suggerita dall’articolo. Per chi ne sa qualcosa, il sentimento di “sorpresa” che permea l’articolo non è che l’indice di uno stereotipo culturale duro a morire: quello di una visione dicotomica, invece che dinamica, della cultura ebraica (o forse della cultura in generale). L’impressione è che sia gli studiosi di genetica che gli storici abbiano non poco da imparare dalla musica ebraica italiana (o forse dalla musica ebraica in generale). Each year at Lag ba-‘Omer I am reminded of the conundrum: why on earth is Shimon Ben Lawi’s ode to Bar Yochai included in the Roman mishmarah? Shimon Ben Lawi (15th-16th century), a kabbalist who lived between Spain and North Africa and a commentator of the Sefer hazohar, wrote a rather funky (in terms of both language and imagery) ode to the alleged author of the Zohar itself, aka Shimon Bar Yochai. The poem, or piyyut, is commonly sung on Lag ba-‘Omer, precisely for the kabbalistic connections that the holiday has acquired in modern times. Now, the very same piyyut is ALSO sung by the Jews of Rome, Italy, on a very different occasion: the mishmarah, or night vigil, that precedes a brit milah, the circumcision of a male newborn. How did it end up in this interesting ceremony of medieval origins? Elliott Horowitz studied this and other nocturnal activities among the Jewish communities of North Africa, Italy and Germany in early modern times. Along with Nello Pavoncello (an Italian rabbi and scholar), he noted how the ceremony as we know it today was crafted by the intervention of Rabbi Tranquillo Vita (Manoach Chayim) Corcos (1660-1730), on the basis of a pre-existing folk Jewish custom. As both scholars already noted, Rabbi Corcos’ intervention was a way to claim the popular manifestation (a night vigil accompanied by food, beverages, songs and dance involving men and women) back into the realm of normative Judaism. It consisted in changing the lyrics of the songs with texts that conformed with a religious experience (the ceremony includes piyyutim like ‘Et sha’are ratzon and, of course, Bar Yochai), and having them performed by a “confraternity” of male singers. In other words, the Rabbi’s input focused on text and on performance. The texts were taken from piyyutim widely known: a poem for the High Holy Days and another for Lag ba’Omer – hence, a direct testimony of how Kabbalah had spread to Rome at the beginning of the 18th century. The changes in the performance practice were probably inspired by the desire to conform to a more standard “moral” conduct. The combination of moral and textual concerns in the modification of a ritual is a distinctive trait predating the Reform movement, which will take place almost a century later. However, what was not touched by Rabbi Corcos’ reformist attempt was the music. Why do I say this? 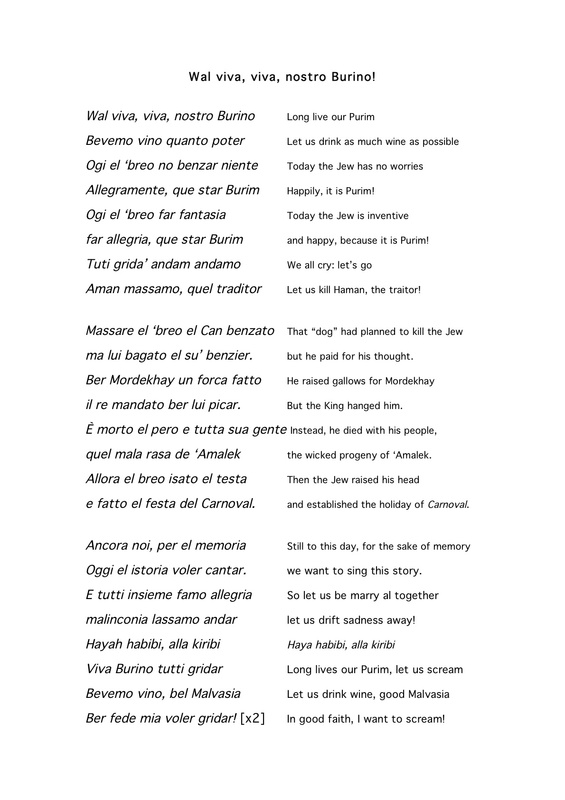 Well, the melody used to this day in Rome to sing Shimon Ben Lawi’s ode to Shimon Bar Yochai is certainly not a liturgical, or paraliturgical song. It is very close to the folk repertoire developed in Central Italy to celebrate Catholic Saints. And it is almost the same as the satyrical ode to Sant’Antonio Abate collected in the Abruzzi region by Giovanna Marini in the 1950’s. The song, performed by Marini herself was popularized as part of the show “Bella Ciao” (1962, by Roberto Leydi and Gianni Bosio). Youtube has a lovely version by the Milanese folk-cabared group, I gufi: Sant’antonie a lu diserte (Saint Anthony of the Desert). The coincidence of a shared musical repertoire between Jewish and Christian confraternities is a very interesting phenomenon, that certainly requires further investigation. It certainly takes us to a time in which, without the help of online social media, ideas and material culture were shared across ethnic and religious barriers.